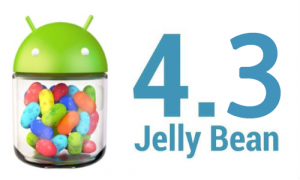 As expected, Google has decided to unveil the brand new version of Android, Android 4.3 (still codenamed Jellybean) in a small press conference on the 24th. However, as much as that was expected, we left the event with much more than just that. In fact, Android 4.3 took a back seat to the unveiling of two brand new devices: the refresh of the Nexus 7 and the brand new Chromecast, which we’ll get into a little bit further. Overall, there is a lot to cover, but let’s take a quick tour and get a general overview of all the new stuff we got from the event. Let’s start with Android! 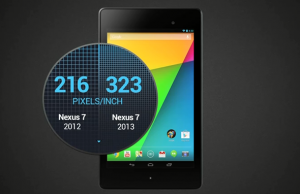 The brand new Nexus 7 comes with much improved specs, and ships with Android 4.3 on day one. One of the best improvements is the gorgeous new screen, which comes with not only full 1080p HD resolution, but improved viewing angles and much better color reproduction. Reading in the Nexus 7 should now be much better on your eyes, and graphics media such as comics should now look better than ever. It also comes with a bigger battery, offering about an extra hour of battery life compared to the old Nexus 7. It comes with a Snapdragon S4 Pro on the CPU side, considerably more performant than the old Tegra 3 that powered the 2012 model, along with a faster GPU and 2GB of RAM, so by no means is this device a slouch, and you shouldn’t have any performance issues on the near future. The device itself is also considerably lighter, thinner and taller when compared to the old model, although the patterned rubberized back that was so popular with the previous model is now out. It also ships with a 5.0 megapixel back camera and a front-facing camera, which although might not be able to capture amazing quality pictures, certainly do the job. The inclusion of a notification LED, a much-criticized oversight of the original model, just makes things the sweeter. It also will be able to use a SIM card and will support LTE on most US carriers (Sprint is not supported) with a single device. Starting at $229 for the 16GB edition, there is no reason not to get one if you were already considering a tablet at this time. The surprise of the show was, without a doubt, Chromecast. No one really saw this coming, and it kind of swept the audience away as people started to realize the potential of this device and what it would mean for your TV-watching experience. Chromecast is, in simple terms, a media streaming adapter than you can plug into your HDMI-enabled TV. 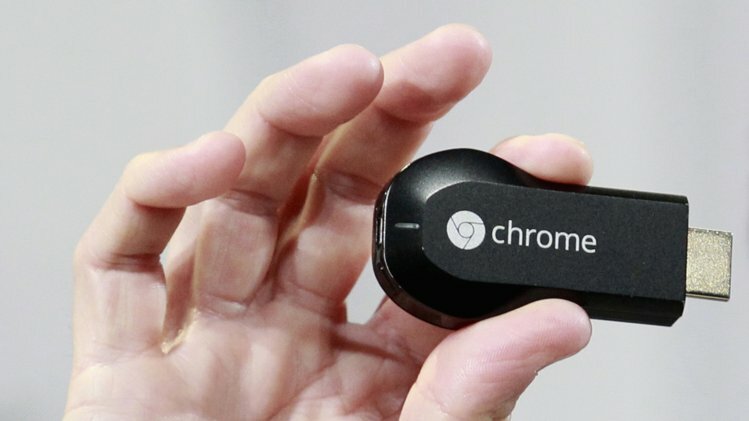 What that means is that you can send data and display things on your TV seamlessly from any device that supports Chromecast, and that Chromecast can itself fetch content from the internet. The examples shown included playing a YouTube video on your phone though the YouTube app, and with a tap of a button get the video to display on your TV directly, even turning the TV on in case it was off. Of course, this will be possible with any app that supports Chromecast, and apparently support is very easy to integrate and will be coming to more apps in the future, and an SDK is already in place to allow devs to develop for it. Besides being usable by your Android phone or tablet, even your PC can take advantage of Chromecast through the Chrome browser, allowing you to browse on your TV directly, or send videos to Chromecast through the YouTube website. “Tab casting” is what Google calls the ability for Chrome to project any tab on your browser onto your TV. Chromecast hides the URL bar and all the Chrome UI, just showing your the web content, which is incredibly nice. However, unlike a native YouTube or Netflix experience, the image will not be as sharp or colorful, as it is being compressed and sent from your browser directly. 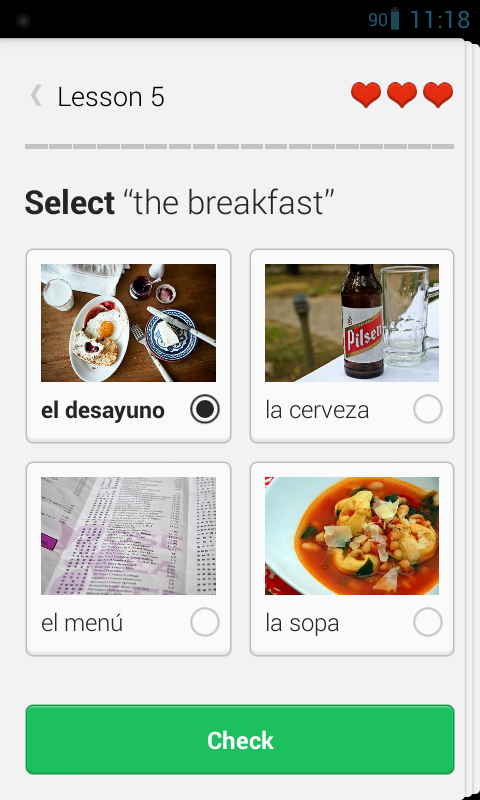 Still, very impressive feature, and incredibly easy to do. Retailing at a mere 35$, this is a steal and a nice play from Google to capture a new market segment and integrate their devices even further. Phew, and that’s about it for this event! In passing, I found 4.3 a natural evolution of Android: a couple of new interesting features, the expected under-the-hood improvements and a more consistent and integrated user experience. However, I wouldn’t blame you for feeling disappointed after the absence of 4.3 at I/O, as the impression was that something major was on its way. 4.3 isn’t a major departure, but maybe that’s a good thing after all, as only now is Gingerbread actually becoming phased out. About Nexus 7, I gotta say that I am impressed, the specs bump was actually quite nice and the improved screen will make a major difference, because it is one of the deciding factors when it comes to the tablet format and there’s really no competition at this point, especially at that price. Chromecast was, for me, the great surprise of the show. The reveal was unexpected and although the demo was all good and everyone could see that this device had a purpose, the small price really cemented the deal. I, for one, haven’t turned my TV on for almost months, and consume all my content on either laptop or phone, even if the visual or sound quality isn’t as great, because there’s no easy way to consume my media on my TV. Yet, this little device could change all that. What did you think of the new stuff at this event? 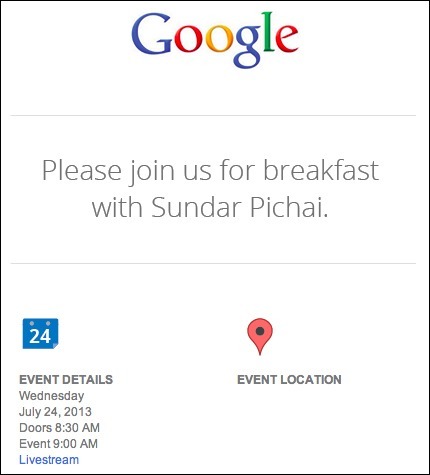 Are you thinking of picking up a Nexus 7 or a Chromecast? Let us know your experience in comments! Google Nexus 7 Tablet Announced!